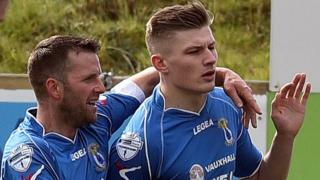 Andrew Mitchell grabs a double to take his season's tally to 19 goals for Dungannon Swifts as they ease past Portadown 2-1 at Shamrock Park. The Swifts have taken 10 points from their four fixtures against the Ports and lie eighth in the table, one point behind Ballymena United. Nathaniel Ferris scored for ninth-placed Portadown, who are five points ahead of bottom-placed Warrenpoint Town.